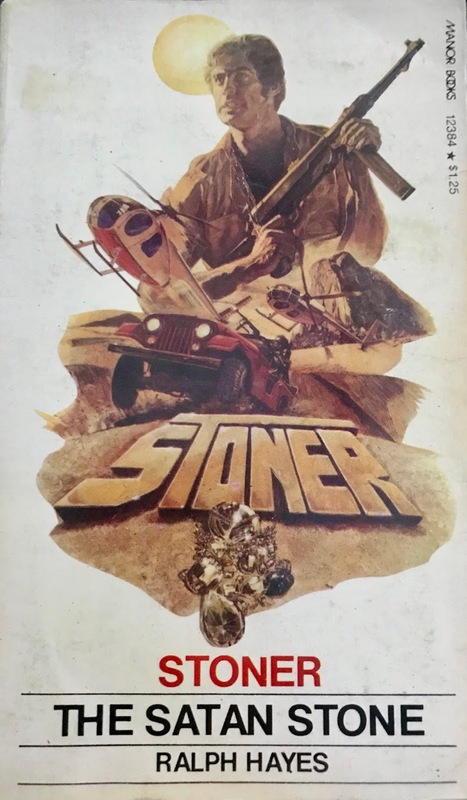 “The Satan Stone” is the second installment of Ralph Hayes' 1970s treasure hunting action series 'Stoner'. Our hero is Mark Stoner and this four book series focuses on the character attempting to find precious stones – thus the name could be duel usage. This book is my first taste of the series, but I've enjoyed the author's exceptional line 'The Hunter' (sometimes called 'John Yard'). It shares a lot of the same exotic locations as this series – sweeping African deserts and rowdy towns like Lagos and Nairobi. It wouldn't surprise me to see crossovers from each line, but I'm not sure Hayes' had publishing permission or the motivation. As I delve into each series more, I'd love to see a reference to the other books somewhere. I could easily imagine John Yard crossing paths with Stoner or even Yard's colleague Moses. These two series' run parallel to each other, so it would make rational sense to have them entwined. The first 37-pages of “The Satan Stone” is intriguing and presents a phenomenal problem – how do you smuggle a 1,000-carat diamond out of a mining prison? That's the issue at hand for an engineer named McMillan. He has come to the mining prison of Shoshong, in the South African desert, to provide a new sorting machine. The arrangement is he receives profit sharing for a year in trade for this new machine. De Villiers, the book's dictator/prison warden welched on the deal and now a dejected McMillan is leaving the camp with nothing. Kicking some dirt and dust, he miraculously discovers an egg-sized diamond. The prison is notorious on security, and routinely beats (or murders) thieves. McMillan, fearing that he will be caught, hides the diamond on the undercarriage of a bulldozer with hopes of retrieving it and escaping. 37-pages later, the diamond is still securely dozing and McMillan has killed a helicopter pilot while escaping through the desert. Thankfully, chapter three gives us a brief introduction of Mark Stoner. He's an adventurer and exporter based out of Key West (home of author Ralph Hayes). He globe-trots buying precious gems and artifacts. While wealthy and free-spirited, he's still a hunter for allusive treasures and antiquities. Thus, McMillan and his awareness of the prized diamond are an inviting challenge for Stoner. McMillan contracts with Stoner to have the diamond retrieved from Shoshong. The issues are aplenty – breaking in and out, passing security and dodging the mine's Gestapo-like cartel called The International Diamond Security Organization (IDSO). Plans are concocted to put Stoner inside the prison under the guise of a recently killed security inspector from the IDSO. 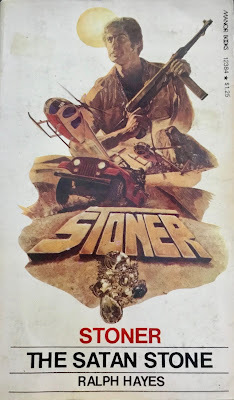 Once Stoner infiltrates the prison, his exploits to retrieve the diamond are a bulk of the story. Hayes' is masterful in the cat-and-mouse tactics and leads the reader on numerous paths speculating the outcome. While not sounding overly complex, there's several side-stories that enhance the narrative – a suspicious guard, an inmate/laborer in the know and McMillan's own struggles escaping the IDSO in Nairobi. Surprisingly, this novel may have the most exhilarating scene ever involving a simple phone call. It's so elementary, yet the entire white-knuckle finale hinges on it. I've said this previously in my reviews of Ralph Hayes extensive catalog. The author takes seemingly normal, everyday people and places them in extraordinary circumstances to see how they react. It works well here as Stoner doesn't necessarily have the fighting skills or know how to solve difficult issues. Like 'The Hunter' and 'Buffalo Hunter', often Hayes leaves it to complete ignorance on the part of the characters or sheer luck to decide life or death situations. It's this aspect that makes his writing so enjoyable. It might be nonsensical, but you have to at least believe there's a “lucky shot”. That's the Hayes' style. I'm on my very own treasure hunt now, fueled by the anticipation of securing the entire series for my paperback museum.